And here we are, the final photo of Weekly Fifty for the 2016 year. I’m posting this one in particular for a couple of reasons, and it’s designed to be somewhat of a companion piece to last week’s image. First off, you might note that its composition bears a striking resemblance to last week’s image in that the photo is horizontally composed with the subject along the right-hand third. In both images I am standing below and looking up, and there is a vast expanse of sky on the left side. Both pictures involve the sun as a key element even though in last week’s you see the effects of its light and not the solar object itself. And both pictures, I hope, present a sense of awe, wonder, and possibly even inspiration. They did for me, anyway, and I dare to think they just might do the same for you the viewer. Last week’s image was titled “Rise” and this one is “Set” not just because the sun is on its way down but because the year is coming to a close. I shot this in the middle of October but have saved it until now because it represents, to me, a sense of closure while also a sense of hope and even anticipation for the year ahead. Now, it’s also important to remember that this is just a simple picture I snapped one day while walking around Theta Pond and I’m not trying to change the world or anything like that. The image is not fancy and did not require special effort, and I’m not trying to make a big statement or anything. I just thought it would be nice to use as an end-of-year photo and I hope it serves that purpose decently enough. Keen readers might see echoes of similar sunburst-style images that I have posted in the past and while this is not meant to be a retread of familiar territory, I do think it is worth revisiting a certain style, subject, or type of photography in order to practice and get better at it. Ever since I learned how to take pictures with starburst patterns it is something I have enjoyed repeating and this is yet another example. 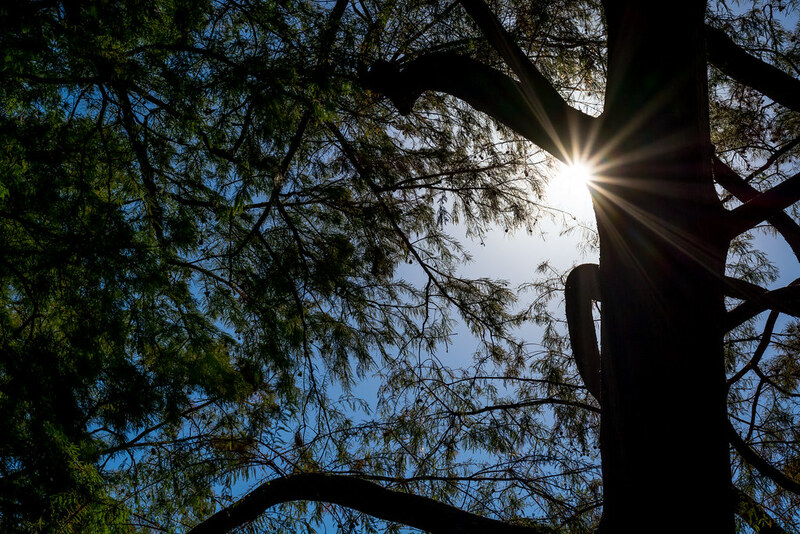 I tried a couple different ways of composing the image and moving around so the sun was placed at different spots, but I kept coming back to this one where it was peeking out from where the branch extends from the main trunk. I can’t exactly say why other than it just seems to fit nicely, and I like that the sky is somewhat clear in the area surrounding the sun and darker on the left side with the overhanging cypress branches. I shot this at f/11 to get several rays to appear without being overwhelming, and just like last week the only major adjusting I did (which turned out to be quite minor) was to adjust black levels and saturation. Thank you for the inspiration that you have provided for me this year in how I view my photography hobby. I am looking forward to the coming year. I hope you also have a happy prosperous new year. Thank you so much for your nice comment Dennis! I’m glad to have you as a reader here on Weekly Fifty and, more importantly, I’m thrilled that you are learning and growing as a photographer. Here’s to a productive and enjoyable 2017! I enjoy reading the story behind the photographs. Thank you for sharing.